Charity truck show veterans Ron and Julie Duncan. A couple of hundred trucks turned out for the recent Riverina Truck Show and Kids Convoy at Wagga Wagga in south-western NSW. 'Best Truck Under Three Years' went to this Mack Super-Liner. It’s the fourth gong the big Bulldog has received at truck shows this year. 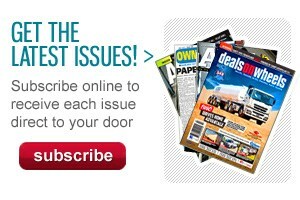 Proud driver and caretaker is Ron Duncan, from Ross Transport at Wollongong in the Illawarra region of NSW. 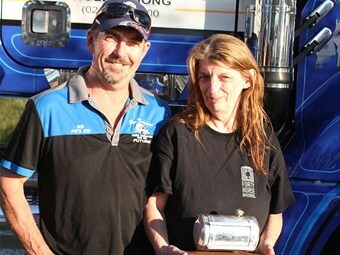 Duncan and his wife Julie are what you might call 'professional' attendees at truck shows anywhere in eastern Australia which raise funds for charity. Of course that involves volunteering a lot of their time, Ron working the shows in with his trips as a long distance driver pulling general freight tautliners, and Julie being a volunteer with Trans-Help Foundation and convoy committees. They couldn’t do it without the strong backing of Ron’s employer Alan Ross, who himself has been a major supporter in terms of both trucks and dollars for the annual i98FM Camp Quality Convoy in the Illawarra. 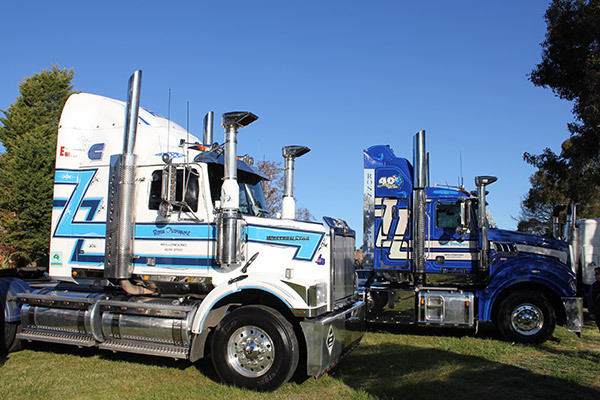 Ross Transport has almost 60 prime movers and its white trucks with blue striping are a familiar sight in NSW, traditionally associated mainly with the steel industry. The company is celebrating its 40th birthday this year, with family matriarch Fran Ross still involved in her 80s. An aspect of the show Mack’s sleeper which is unique as far as Macks pulling 34-pallet B-doubles go, is that it’s a 40 inch High-rise. The standard Super-Liner size for B-double work is 36 inches (or 52 inches for 32 pallets). This Super-Liner’s 16 litre MP10 engine is rated at 600 horsepower (440kW), which can be pushed up to 685hp (500kw) if desired. The engine is matched to Mack’s 12-speed automated manual transmission called the m-Drive. So what does Duncan think of the push-button gearbox? "I was a bit of a convert on them pretty quick actually. Duncan hopped into the Mack after four years clocking up 900,000 kilometres in a Western Star with an 18 speed Roadranger box and 600 horsepower EGR Cummins power plant. Duncan reckons the Mack is "just a different truck in lots of ways." "The European styling of of them, in the ride, in the comfort, the noise levels within the cab – all our guys call it the Volvo, and I always say to them, ‘It’s not a Volvo, it’s a bonneted Volvo, get it right’. 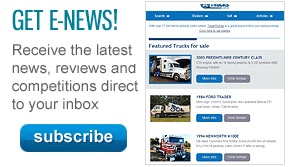 "That’s coming to the fore in the quality of the trucks that we are driving on the roads these days. "The K200s, they’ve come a long way from the Aerodynes in the style of driving them, and driver comfort levels and everything else." While Duncan loved driving the Western Star, he likes the Mack even better. "The Stars, as much as they are a really, really nice truck to be driving, they are an extremely hot truck internally," he says. "They’ve got an engine cowling for the three-quarter engine which is back inside the cab … We have 10 of them in our fleet, every one of them is the same in that you get a lot of heat coming through into the floor levels. "But in the Mack, there’s absolutely no internal heat in the cab."